I straighten my dress, rearrange my scarf and examine my coat for lint in the quiet elevator ride up from the parking garage on Two Rodeo Drive in the heart of Beverly Hills. 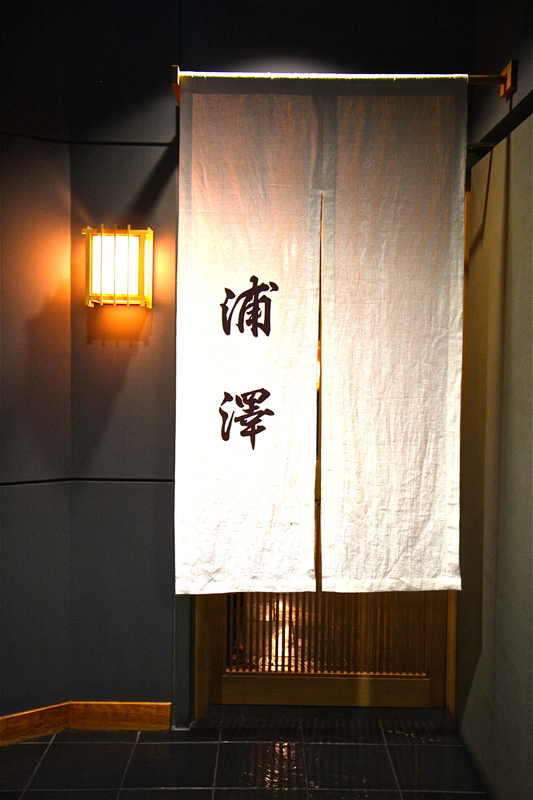 As the doors open into the dark hallway, I pause to clear my throat and my mind of the day’s insanity before ducking under the white linen noren inscribed with the restaurant’s name. It is important that I look and feel my best before entering the sacred grounds of this culinary temple called Urasawa. 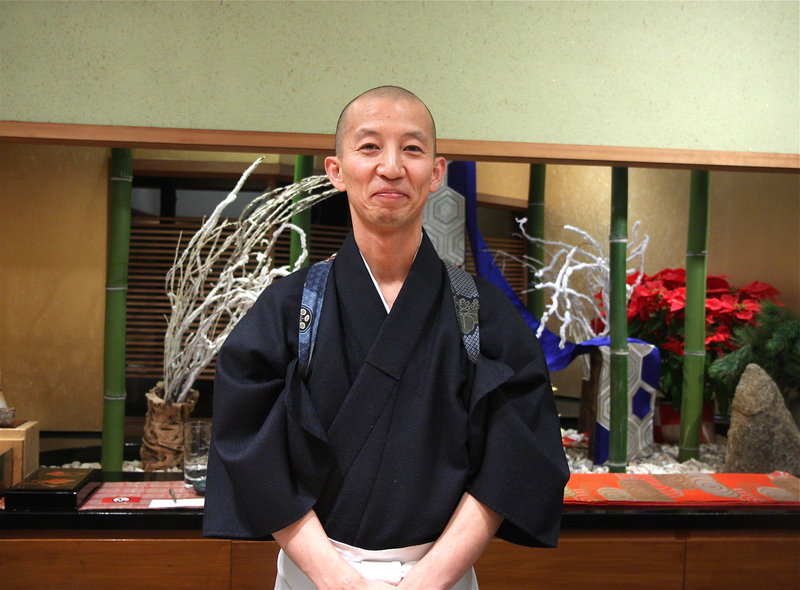 Chef Hiroyuki Urasawa, dressed in a sharp navy blue kimono, greets me with a waist low bow as I reciprocate with a longer bow, then settle into the seat directly in front of him. ‘It’s been a long time,’ he says, and to my pleasant look of surprise he quickly follows with ‘has it been 7 years? How is everything at the hospital, doctor?’ I’m flabbergasted that he remembers me from so long ago, yet at the same time not, for a true professional like him never forgets a customer. Especially when that customer is somebody who survived his last meal. 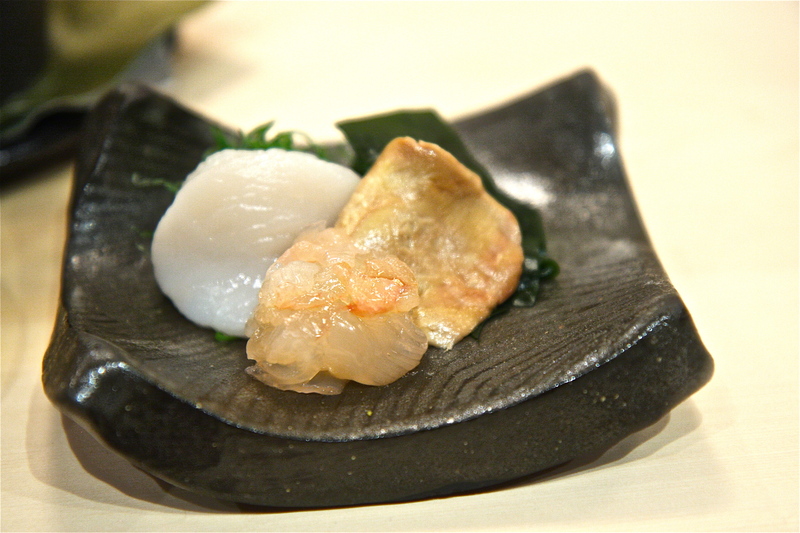 7 years ago on my first visit to Urasawa, I had a delicacy that is known for causing a slow miserable death through asphyxiation and paralysis with no antidote or cure. Through a day long process of cleaning and draining that only a professional like him knows how to do, he stripped the product of its toxins to produce a beautiful fatty morsel of delight, resulting in a life changing, and luckily not a life ending, moment of culinary inspiration. This exquisite delicacy (which I will not name for fear of getting him into trouble) was frightfully delicious, and I felt happy to be alive, in more ways than one. It’s not often that I trust my life to somebody, but Chef Hiro is an exception in many ways. Hiro Urasawa is the very embodiment of a Japanese master- devoted to his craft, constantly in pursuit of excellence and perfection to the point of obsession. Balancing precision and artistry to create the ultimate form of beauty. 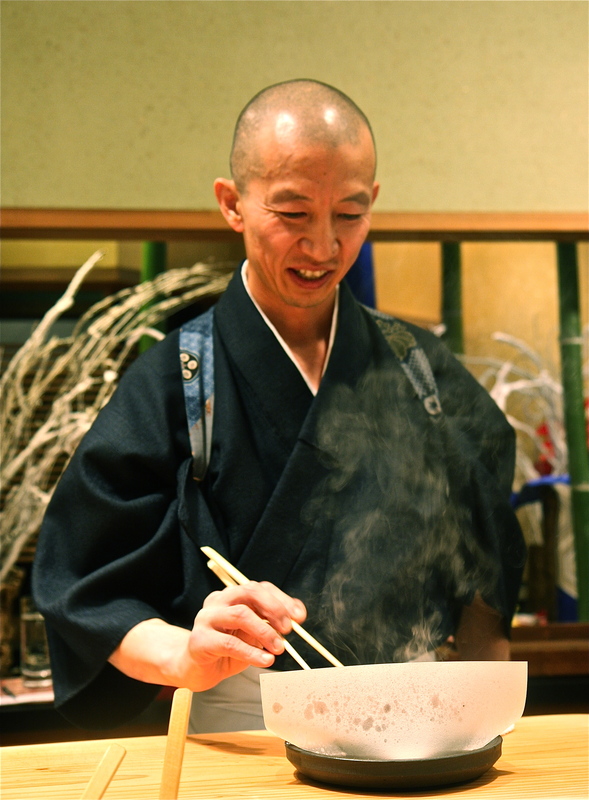 Sacrifice to be the best at his discipline, yet incredibly humble, never considering himself at a status more elevated than a student of life and a pupil of his mentor Masa Takayama whom he inherited this restaurant from. Most of all, it is his thoughtfulness to create the ultimate dining experience for each and every customer. Such meticulous attention to detail and consideration is visible in his magnificent flower arrangements that reflect the seasons, palpable on the soft cypress counter that is sanded down every day with 3 types of sandpaper, savored in the beer that is served at the perfect temperature down to the millidegree and appreciated in every glance and smile that he casts my way. With one silent nod, he summons his server to lay a white napkin on the counter upon which to lay my camera, not because he is afraid that my camera will damage the pristine cypress, but because he doesn’t want the cypress to somehow damage my pristine camera. 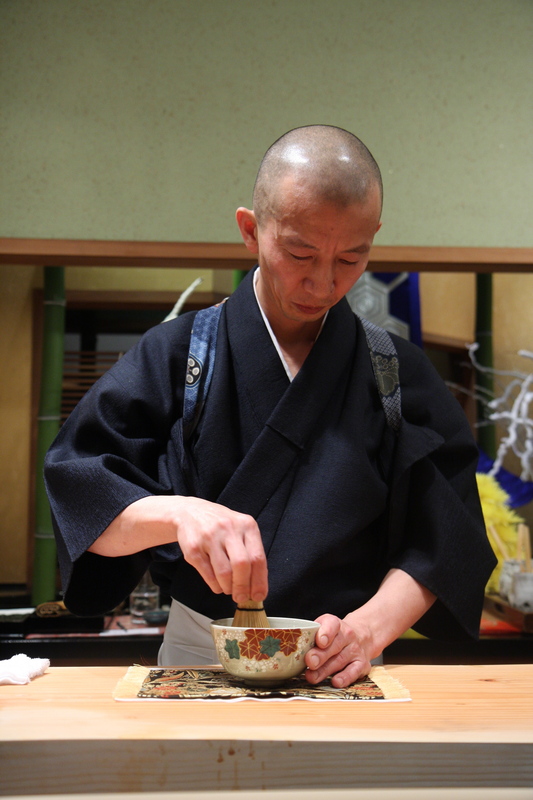 In the presence of this master, my posture naturally straightens while my eyes and shoulders soften, and I prepare myself for an exceptional kaiseki experience. 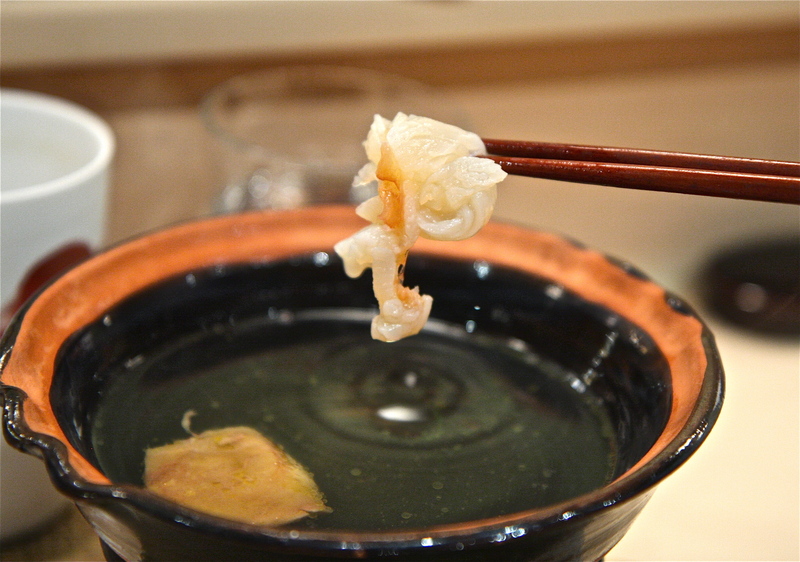 Horsehair crab from Hokkaido, known as kegani in Japanese, is shredded and tossed with mitsuba leaves and yellow chrysanthemum petals (kikka). 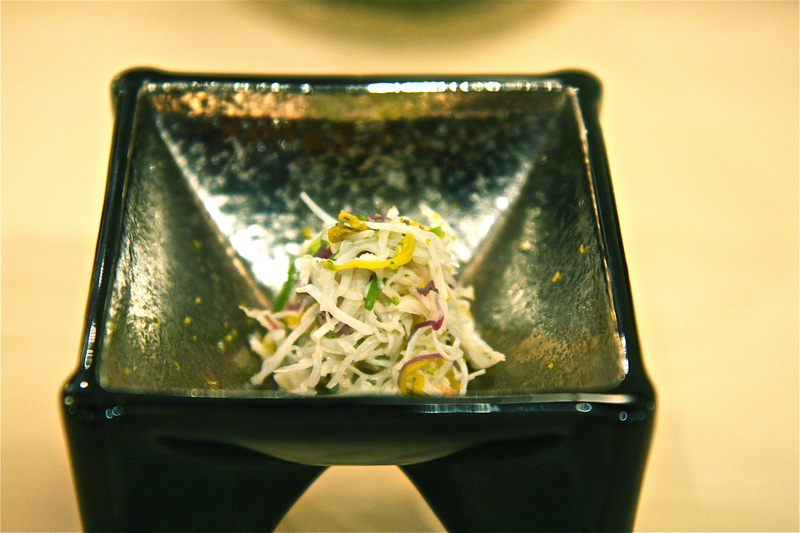 Each ribbon of flower petal and green mitsuba leaf is cut to the same size as the shreds of crab meat to create symmetry and balance of flavors, colors and textures in this simple sakizuke appetizer that is elegantly presented in a gold and black lacquer bowl. Decadence when done poorly is debauchery, but decadence when done tastefully and for the pursuit of excellence and beauty is divinity, like the seared toro wrapped around monkfish liver (ankimo) and myoga ginger, neatly tied in the center with a strip of Kyoto turnip and tressed with a caviar updo. Little yellow flecks of yuzu rind add a refreshing aroma to the ponzu sauce, and like social débutantes, these aristocratic ocean delights, immaculately groomed, fitted, brushed and powdered, are presented on a brightly shining golden pedestal. While the Japanese hold an appreciation for beauty in things that are skewed, imperfect or incomplete through the aesthetic values of wabi-sabi, we also strive for creating and maintaining beauty through perfection and symmetry, especially that of nature. 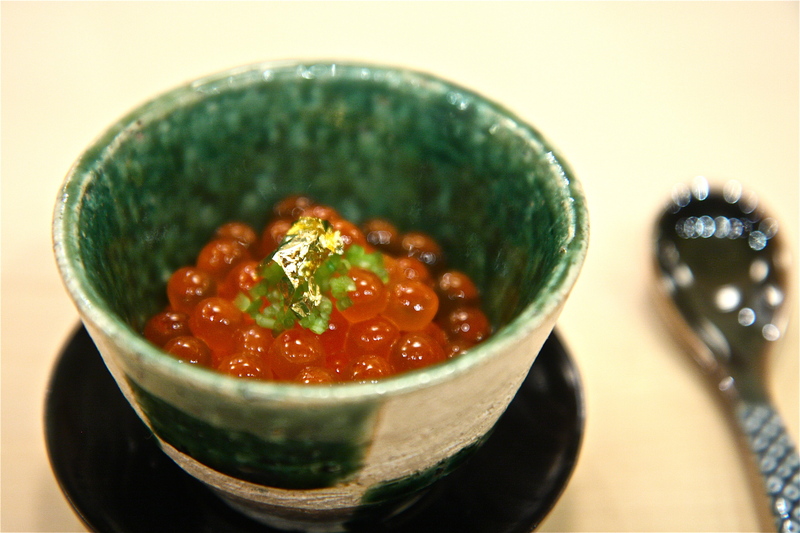 Perfectly round glistening balls of soy marinated ikura salmon roe, each an exact clone of the other, are worthy of stringing into a Mikimoto necklace, its fresh taut membranes succumbing to my bite with audible pops. What lies underneath these miracles of the sea are succulent shiraebi white shrimp from Toyama prefecture and a pleasantly sweet and creamy edamame tofu. 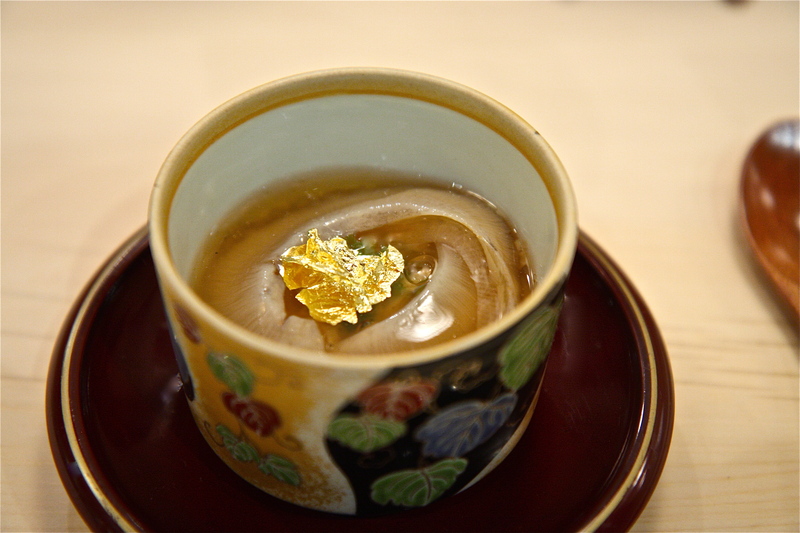 A 24K gold leaf embellishes this dainty bowl of jewels, and while I hesitate to disturb the perfection of this culinary masterpiece, I indulge with full force, for an empty bowl and a clean spoon, in the end, is the perfection that Hiro is seeking. If water could have feelings and dreams, it would aspire to become the ice block that Hiro personally chisels and sculpts by hand for his sashimi tsukuri. 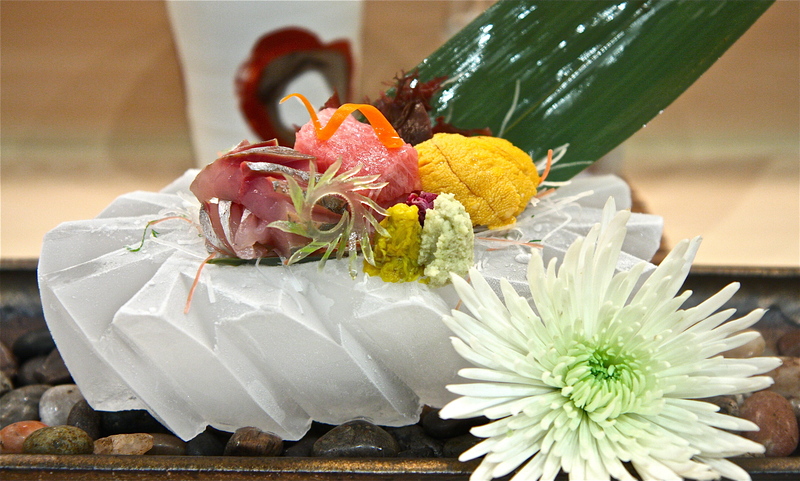 Perfectly cut in a fanned out pattern of a blossoming flower, the ice block proudly displays the fresh offerings of the evening- buttery uni, tender toro and savory aji with intricately prepared garnishes of carrots, seaweed, chrysanthemum petals and freshly grated wasabi. The ice dutifully keeps the sashimi at its optimal temperature and doesn’t think twice about being thrown away after one use, for it is exactly that fleeting yet deeply intimate moment with Hiro for which it was born- and it, and I, are both content. 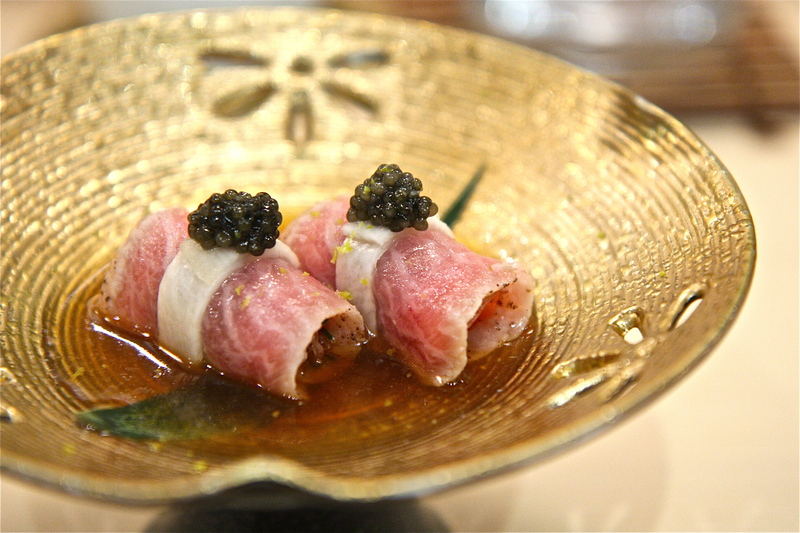 Hiro makes an interesting version of ‘Wagyu beef tartare’ by simmering the meat for 6 hours in soy sauce, sake and mirin, resulting in an intensely sweet mouthful of what reminds me of tsukudani. 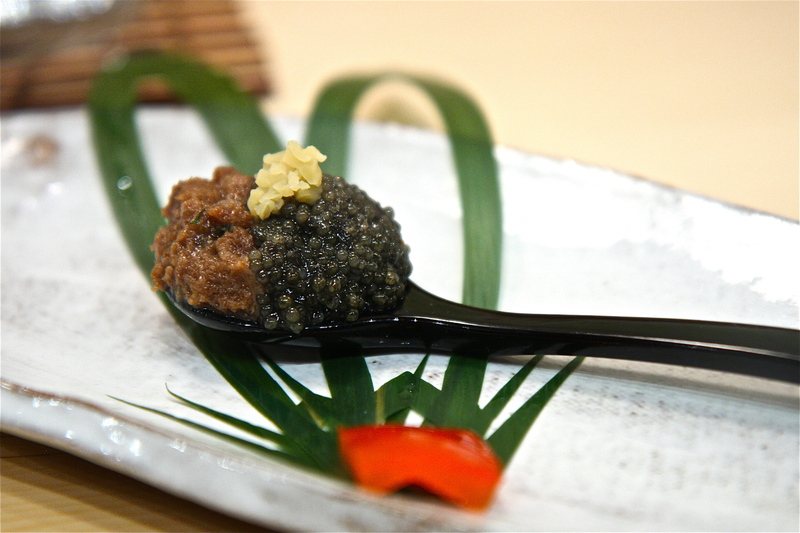 The beef is balanced on a black lacquer spoon with a generous heap of caviar and a garnish of takuan pickled radish for an interplay of sweet and salty flavors, a contrast that is heightened with a concluding bite of pickled red bell pepper on the side. Shark fin chawanmushi arrives warm in a hand-painted Japanese ceramic cup, the luscious collagenous fins layered in gentle loving curves around a gold leaf like a flower bud hiding a secret. The bonito broth releases an inviting aroma while adding glimmer and shine to the glorious shark fins from Kesennuma. I slowly slip each fin into my mouth, closing my eyes as I appreciate the texture of the fine gelatinous fibers against my tongue. Thereafter my archaeological excavation begins as I dig my spoon deeper into the light egg custard to discover and devour embedded shiitake mushrooms, shrimp, ginger, yuba, gingko nuts and ultimately uni, prompting a gasp of delight. After proudly showing off a hot stone and a plate of marbled kama toro to me, Hiro begins preparing the ishiyaki course behind the counter. The moment of contact between kama toro and hot stone creates a dynamic sizzle and a magnificent puff of aromatic smoke that perfumes the restaurant. A white paper screen partially blocks this process from my view, but also protects me from the random splattering of melting tuna fat ricocheting off the stone, a gesture of kindness that I appreciate. 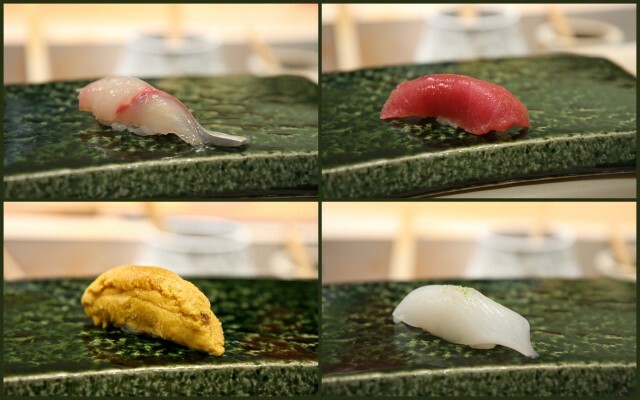 The heat of the smooth flat stone, no doubt chosen as the stone for this task from thousands of others, liquifies the marbled fat into a decadence augmented by ponzu that sinks well into my taste buds. Kensaki ika, squid from southern Japan, is served as a tempura with a squirt of sudachi and a plate of vivid green matcha salt for dipping. 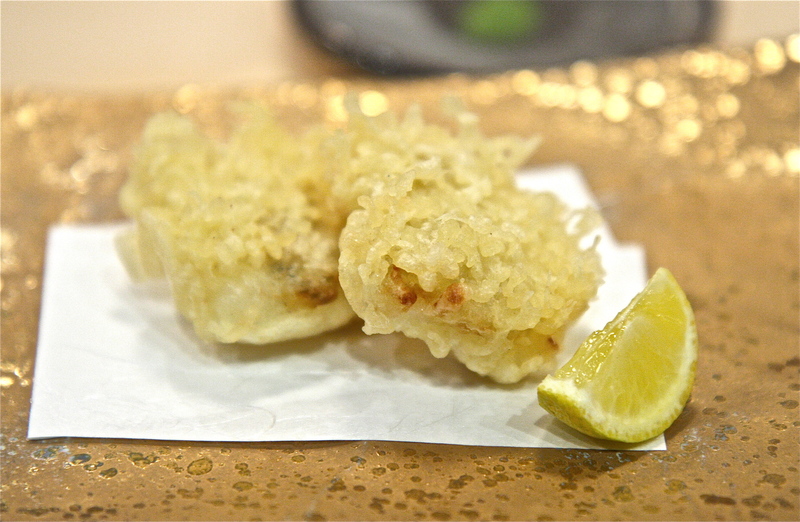 I forget that the tempura is fresh out of hot oil, and the first scorching bite makes me open and close my mouth like a fish out of water. Once the heat dissipates, I find my teeth effortlessly biting into a warm thick cut of squid the texture of room temperature butter. The hint of Japanese citrus and aroma of Japanese green tea bring a sense of familiarity and comfort to me, and along with it the most genuine smile. Foie gras shabu shabu is a signature Urasawa dish, the additional ingredients constantly alternating to reflect the seasons. A warm simmering pot of water with a dish of thinly sliced goose foie gras, lobster and scallops are placed in front of me. Before I can even think of moving my hands, a server slides up next to my seat to do the dipping and cooking for me. ‘Swish, swish’ she goes with the foie gras, its melting fat forming canary yellow droplets of savor that float to the top. Just shy of its complete melting point, she carefully removes the sliver of foie into the dipping bowl of ponzu, and I relish the union of these two contrasting flavors. 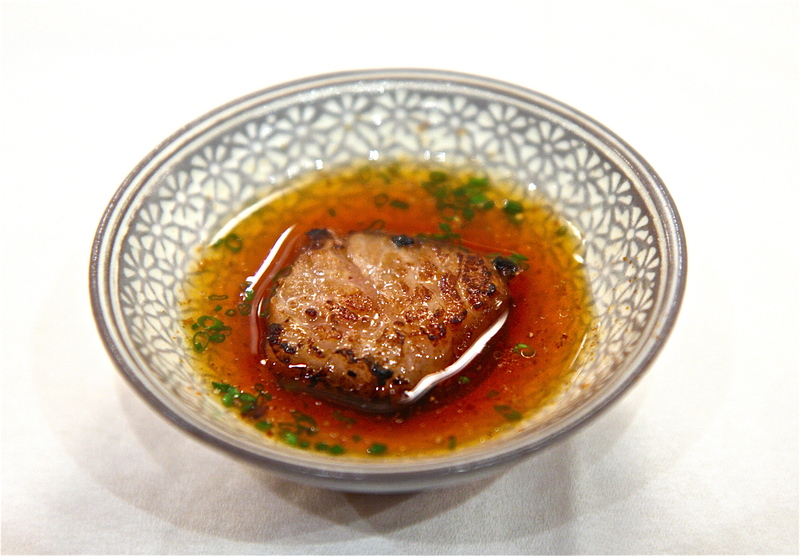 The scallop and lobster, briefly cooked in the foie dashi, also leave me speechless. Hiro’s answer to the traditional gari pickled ginger is a sweet pickle of shinshoga young ginger, thickly cut and pickled in honey, sugar, salt and yuzu. The rustic pickles cleanse my palate in preparation for the climax of the meal, his nigiri sushi that in its simplicity and bareness demonstrate his true skills and expertise. His hands are swift and nimble, moving with the precision of a robot, yet executing each maneuver with the tenderness and care of a newborn’s mother. 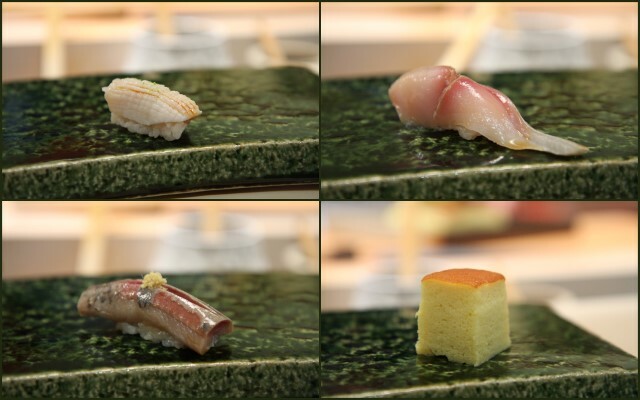 He starts bold with a fatty cut of toro, then a seared aburi kama toro, the same exquisite cut of collar toro that made its debut on the hot stone. A silky shima aji that lingers on my palate, followed by a lighter Kumamoto snapper with sprinklings of grated sudachi zest. 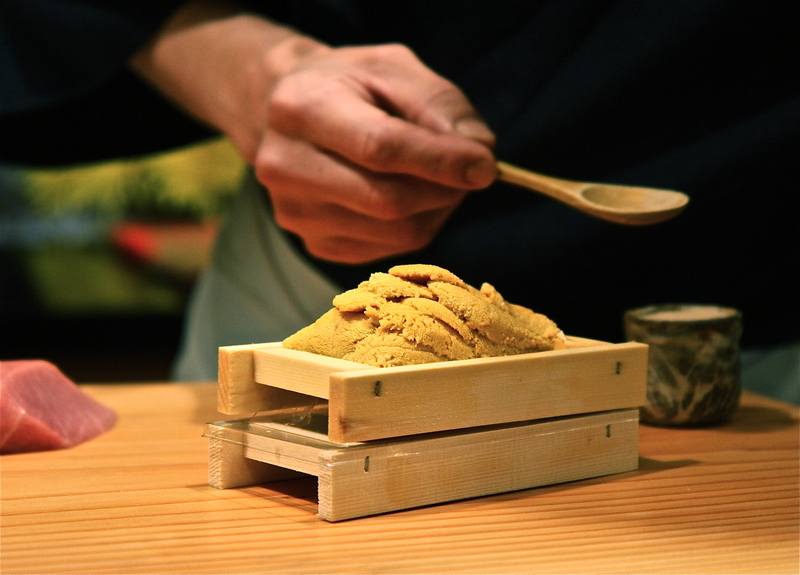 My salivary glands release its juices at the mere site of the wooden boxes of sweet Santa Barbara sea urchin, as he carefully spoons them onto the shari sans nori, just the way I like it. Seki aji at its winter peak of fattiness melts in my mouth, maguro zuke lightly marinated in soy sauce creates an explosion of flavors and kensaki ika from Kyushu dressed with home made seaweed salt delights with a butteriness that is distinctly unlike regular squid. Slice, squeeze, drape, cradle, pinch and caress Hiro does for each beautifully prepared specimen of fish, and I take a long second to revere the elegant sushi before savoring it with closed eyes and deafened ears, concentrating every sensory nerve in my body on the glorious bite that I am blessed to have. 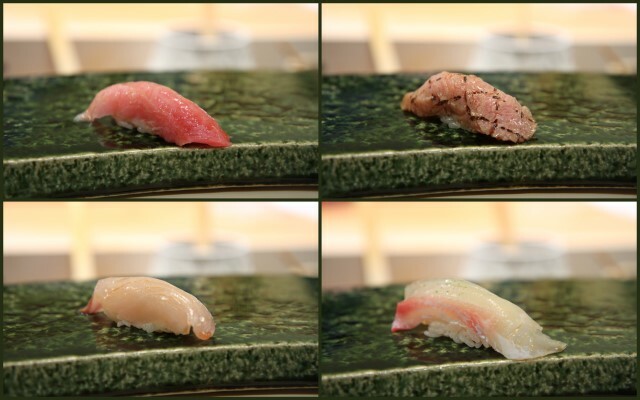 Chutoro, its perfect balance of meat and fat, ends in a sigh of pleasure while kohada, dainty, fatty and optimally marinated in vinegar makes me wonder why I go anywhere else for sushi. Shiraebi is juicy and sayori evokes a young rosebud. 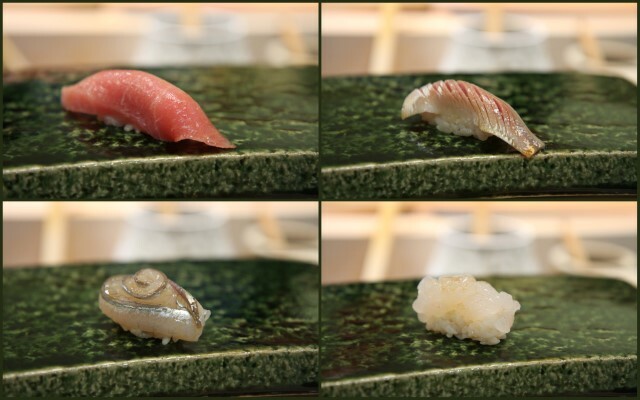 Kuro awabi, abalone from Chiba prefecture, has been steamed to exquisite tenderness and served with a gentle brush of concentrated soy, and seki saba is a shining example of why the line caught mackerel from the Seto Inland Sea is considered the best. Iwashi, winter sardines plumped full of fat, makes me swoon with excitement with its piquant kick of grated ginger on top. En fin, I find the fluffy sweet tamago to be much lighter than I expect, and it practically floats up to the ceiling as I pick it up with my chopsticks. 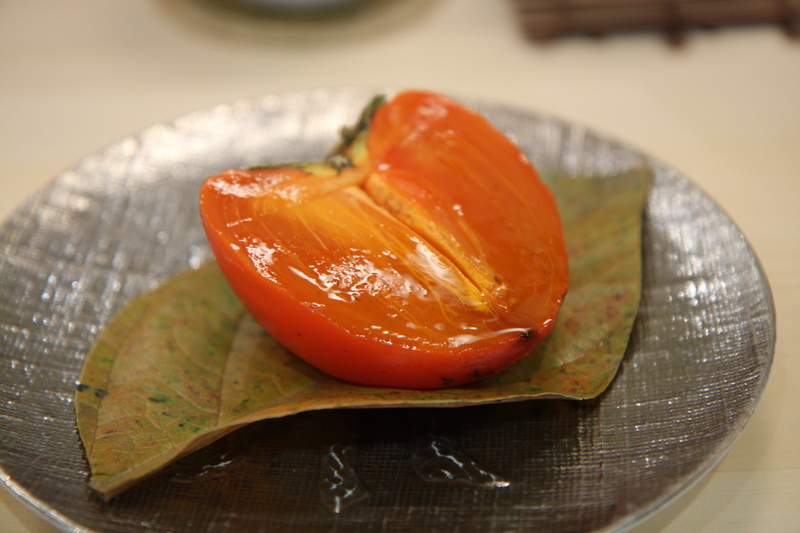 The first of 2 desserts is a Japanese hachiya persimmon that stands alone in its perfect state of ripeness. So ripe, in fact, that the flesh has morphed into a gelatin-like consistency and appearance that almost seems unreal. It has the sweetness, tenderness and softness of a first kiss and I fully succumb to its innocent allure. A second dessert of black sesame ice cream with black truffle, red azuki beans and 23K gold leaves holds up to its reputation with grace and poise, so much so that in my utter infatuation my paralyzed hands fail to grab the camera. 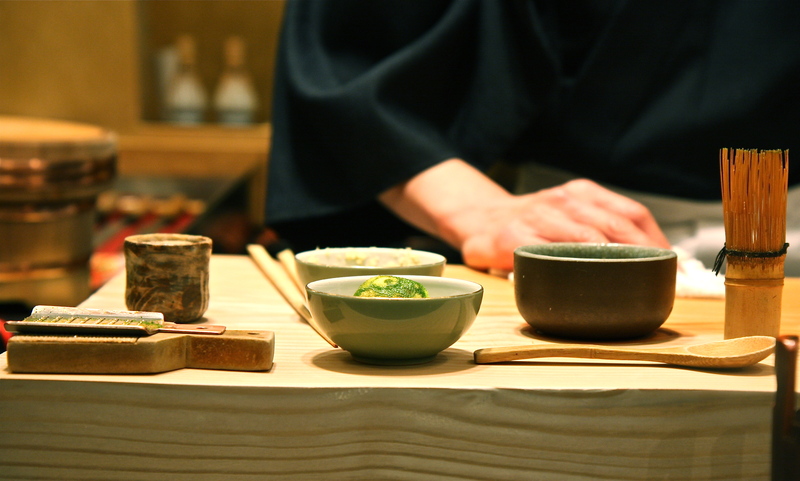 This beautiful meal, flowing from course to course like a Mozart symphony, drawing me in with each successive plate into a state of admiration and ultimately bliss, concludes with Chef Hiro preparing a perfect bowl of matcha green tea. He commands the chasen bamboo whisk with confidence and whisks the liquid into a uniform consistency, the surface a bright green sea of perfectly symmetrical fine bubbles. I show my respect by carefully rotating the ceramic bowl in both hands and sipping the bitter tea in 3 audible slurps in Japanese tea ceremony tradition. A long sigh of satisfaction and serenity…we lock eyes…we both smile. An epic meal. Random trivia: Did you know that soluble tannins in unripened Hachiya persimmons are what cause that astringent unpleasant furry mouth?